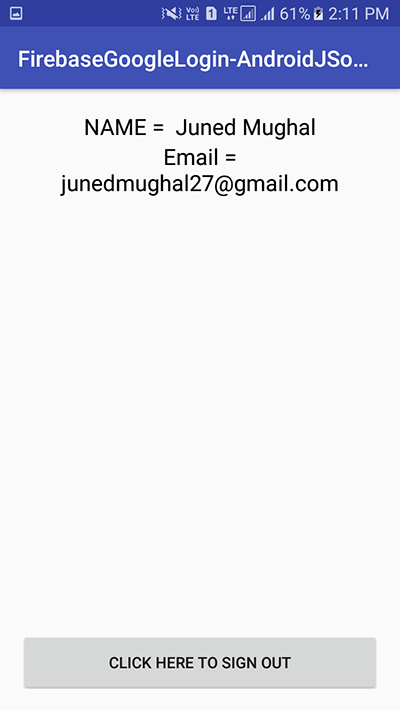 How to Add Google Gmail Google+ Sign In inside Android application using Firebase Tutorial and Show login user Email, Full Name. 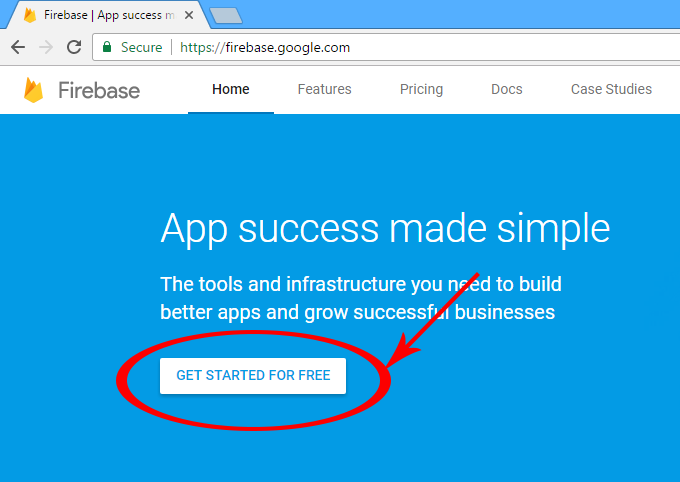 Firebase Google Sign In authentication is very easy to implement in android application. By follow a few simple steps we can easily add Google Login in our app. 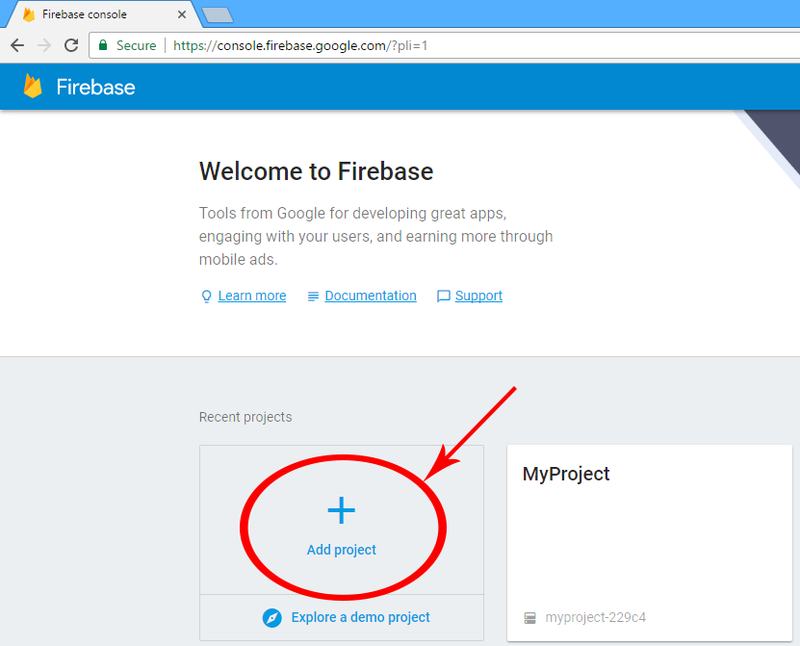 So here is the complete step by step tutorial for Android Firebase Google Sign In Integration Example Tutorial. 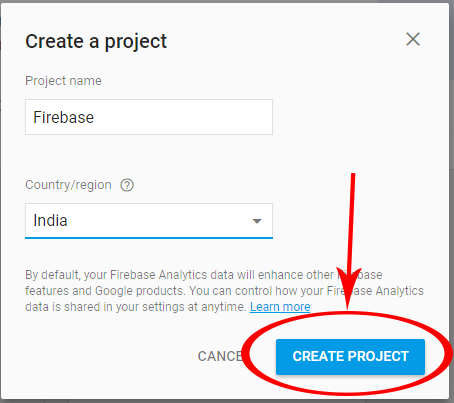 This is a very simple tutorial and if you follow all the steps i am going to mention then you can implement Google Login in your app using Firebase. 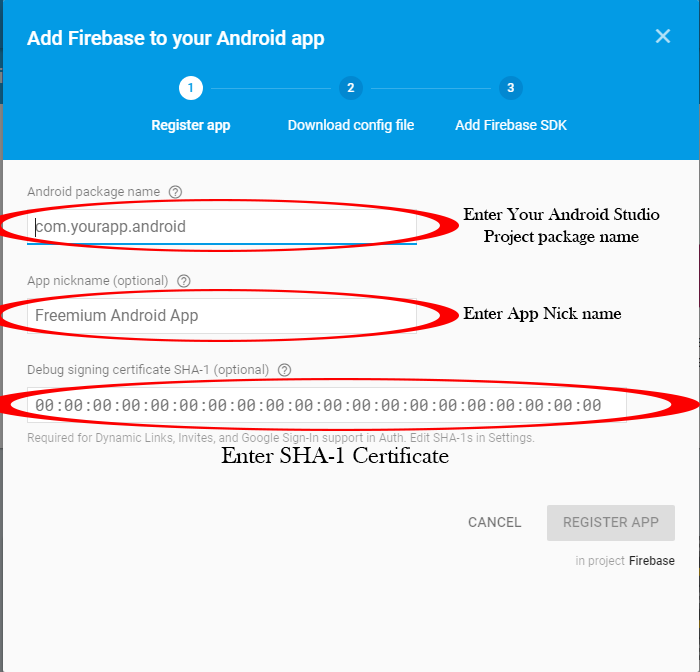 Contents in this project Android Firebase Google Sign In Authentication. Start a fresh Android Studio project. 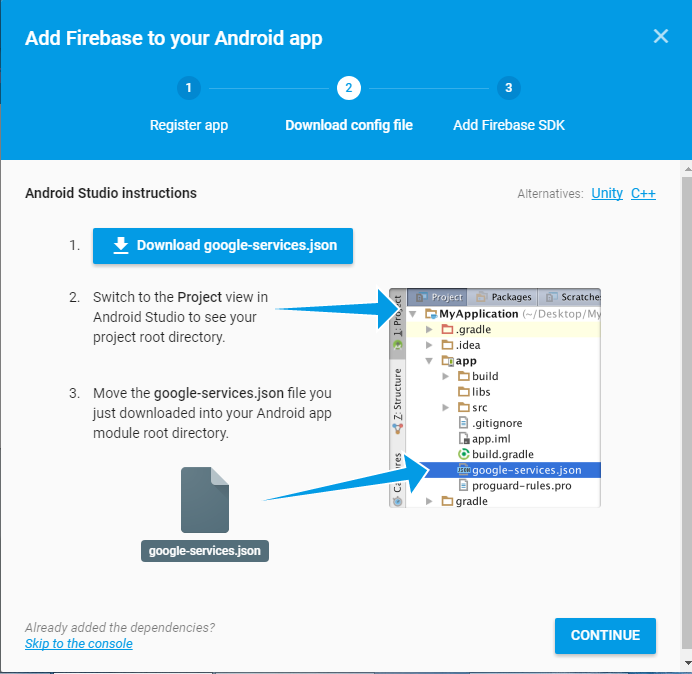 Create, configure and connect Firebase project to your Android Studio Application. 1. Start a fresh Android Studio project. 2. Click on Get Started button present on home screen. 3. 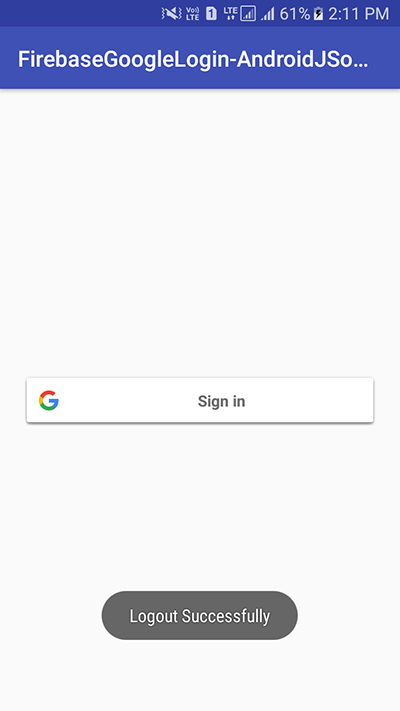 Now log in with your Google Gmail ID. 4. Click on Add Project. 5. Enter your project name and select your country then click on CREATE PROJECT . 6. 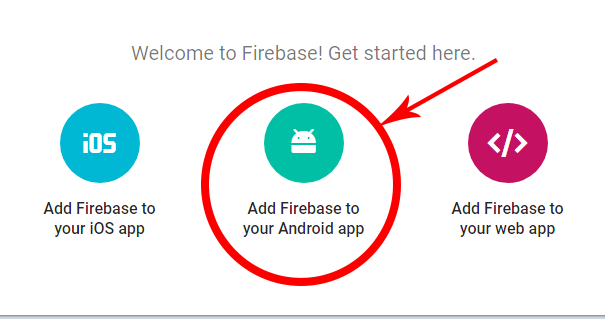 Click on Add firebase to your android app icon. 7. 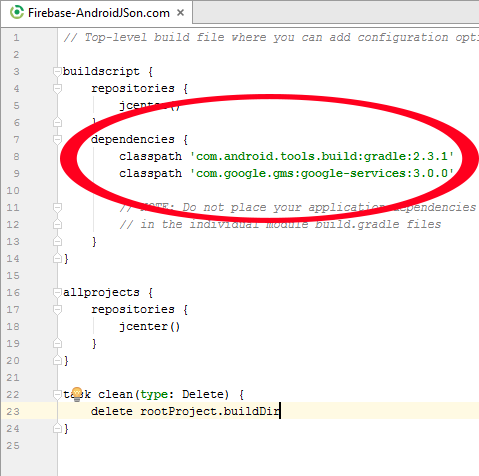 Create a fresh project in Android Studio. 8. Now Add application Package Name, App Nick Name, SHA-1 certificate. To get the SHA-1 certificate from Android Studio read my this tutorial, it is the easiest method to get SHA-1 certificate. 9. Now hit the Register App button. 10. Here you go now your google-services.json file has been successfully generated. Hit the Download google-services.json button to download this file physically into your computer. 11. Next step is to add google-services.json inside your project. So open your project and put( Copy ) google-services.json file inside YourProjectName/app folder. 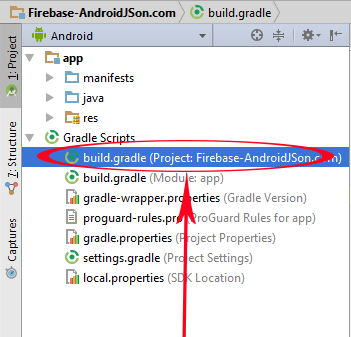 For example my firebase project name is Firebase-AndroidJSon.com then my app folder located is Firebase-AndroidJSon.com/app . 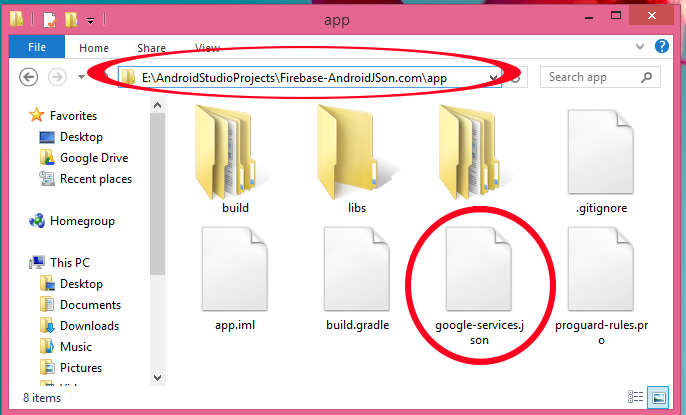 Now copy the google-services.json file into app folder like i did in below screenshot. 12. Now open your Project’s build.gradle(Project) file. 13. Add classpath ‘com.google.gms:google-services:3.0.0’ inside dependencies block. 14. 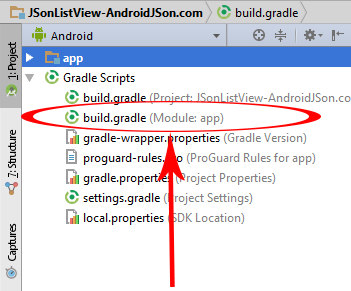 Open your project’s build.gradle(Module:app) file. 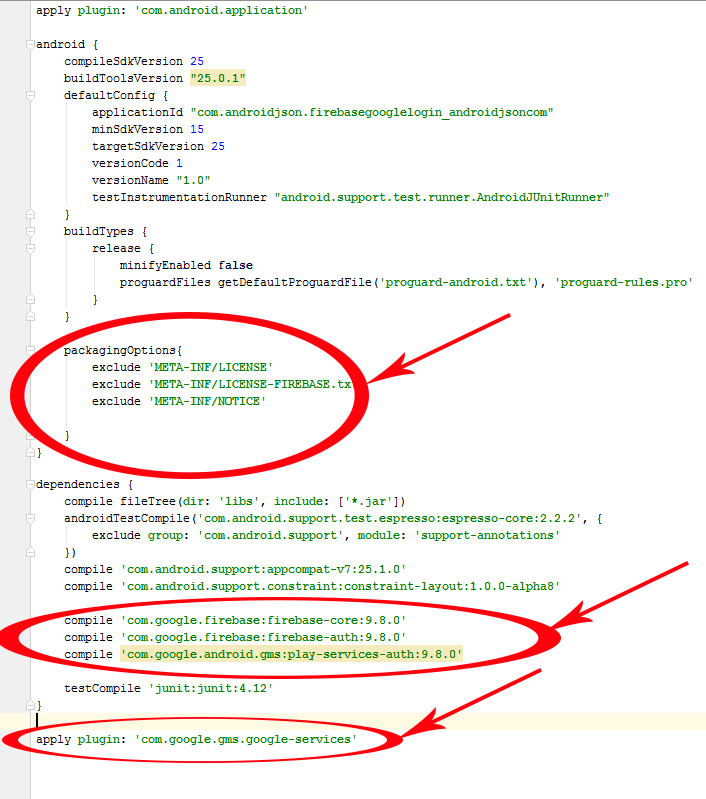 compile ‘com.google.android.gms:play-services-auth:9.8.0’ inside dependencies block . 16. Then add apply plugin: ‘com.google.gms.google-services’ at the bottom of the page. 17. Now finally add below packagingOptions just bottom of buildTypes block like i did. 18. 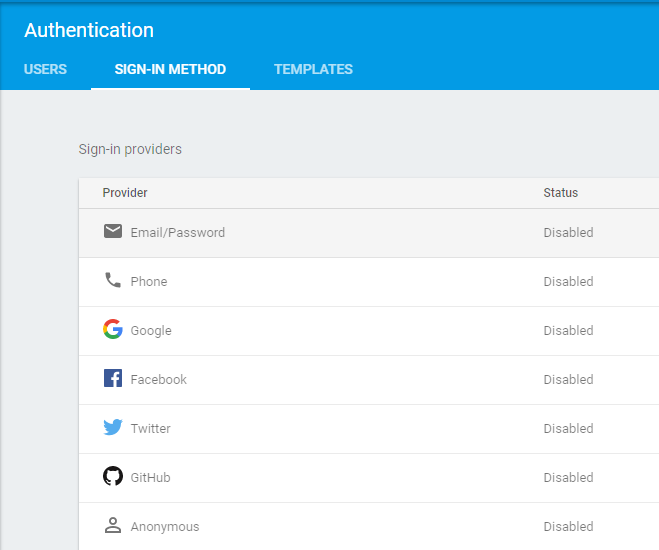 Now next step is to Enable Firebase Google Login from Firebase Panel in Authentication section. So click on Authentication -> SIGN-IN-METHOD . Select Google . 19. 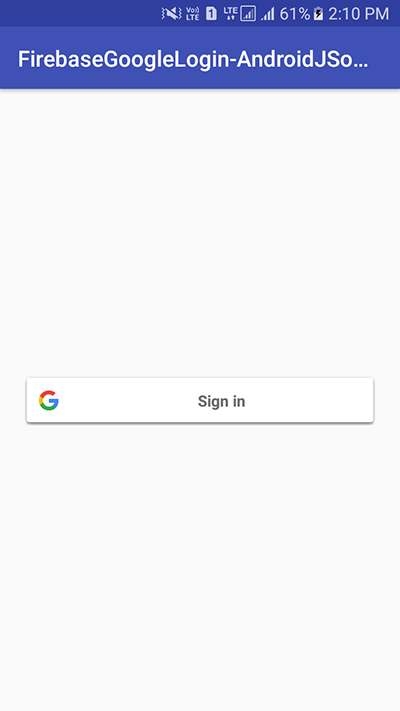 Enable Google Sign in From Panel and hit the SAVE button. Open your project’s AndroidManifest.xml file and copy the below permission inside it. You will find the full AndroidManifest.xml file code at the bottom of this page along with all source code. // Importing Google GMS Auth API Libraries. // TAG is for show some tag logs in LOG screen. // Request sing in code. Could be anything as you required. // Google API Client object. // Google Sign In button . // TextView to Show Login User Email and Name. // Getting Firebase Auth Instance into firebaseAuth object. // Hiding the TextView on activity start up time. // Creating and Configuring Google Sign In object. // Creating and Configuring Google Api Client. // Adding Click listener to User Sign in Google button. // Adding Click Listener to User Sign Out button. // Sign In function Starts From Here. // Passing Google Api Client into Intent. // Getting Current Login user details. // Showing Log out button. // Hiding Login in button. // Setting up name into TextView. // Setting up Email into TextView. // Sing Out the User. // Write down your any code here which you want to execute After Sign Out. // Printing Logout toast message on screen. // After logout Hiding sign out button. // After logout setting up email and name to null. // After logout setting up login button visibility to visible. android:text="Click Here To Sign Out"